Still undecided on where you will celebrate Valentine’s Day? 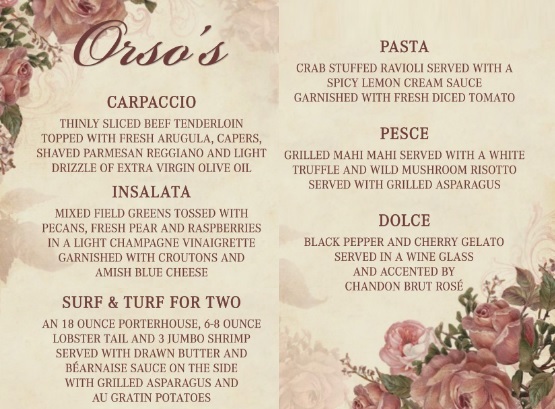 Check out the enticing Valentine’s Day specials at Orso’s. They still have the reservation books open, but don’t hesitate any longer – make your reservation today! Orso’s Restaurant on Wells St. offers much more than authentic Italian food in a charming Old World setting. Yes, there’s the indoor-outdoor seating, a picturesque patio bar that is heated year-round, and live piano on Friday and Saturday nights. Did you also know that the family-owned Orso’s makes daily specials available to its Old Town patrons? Learn more about Orso’s Restaurant here. Orso’s Restaurant is located in the heart of Old Town at the corner of Wells St. and Schiller St. approximately two blocks north of Division St. and two blocks south of North Ave.